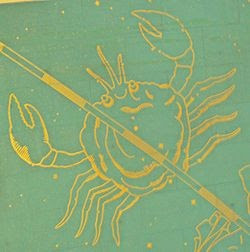 as tropical Cancer, of course, but a crab nonetheless. In Cancer, we sink into our most intimate and vulnerable epicenter. Conjunct Mercury Retrograde, we glimpse into the past to resurrect pieces we've left behind. Introspective and reflective, we find ourselves peering deeper into our inner most nature and sense of self. The New Moon stands in the midst of a rough T-square with Uranus and Pluto--we look deep into ourselves for the source of transformation. With this lunation we must realize that change begins with us; what's happening out there is happening within. When we change, the world changes too. Take this opportunity to stop for a moment; step aside from the stress and heightened activity. Take off the blinders, and get real with what's within you. Don't think about it, just feel what's really there. This New Moon asks us to recharge our batteries so that we're ready for what lies ahead. As the month comes to an end there's going to be plenty of time for action. For now, allow yourself to open up and embrace these yin receptive vibrations. Pushing too much, or trying to force an issue will likely make this a rather difficult and needlessly stressful time. The reality is that many of us are not too clear about where we stand, or what we really need. To demand too much right now without certainty will only make things more complicated. This New Moon opens a portal for observation and deep reflection. If we flow with it we'll be gifted all the awareness we desire. Pablo Picasso's famous adage: "I do not seek, I find", is the guiding statement. Allow yourself to wander freely with your heart and mind wide open. If it's out there, and it's meant to be, you'll simply stumble upon it. 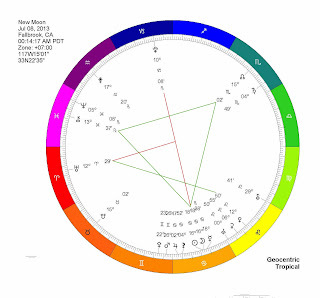 The New Moon trines Chiron in Pisces, opening up visionary, psychic, and intuitive channels. While there may be a lot of tension and inner turmoil stirring up a sense of restlessness, trust that a higher force is guiding you toward wholeness--all in the right time. This trine is very supportive, nurturing, and integrating. It allows us to look at or deal with intense or painful material from an expanded perception, and potentially gifts us with effective pathways of healing and integration. Venus in Leo trines Uranus in Aries, igniting passion and creativity. The more we closely align ourselves with our inner and higher selves, the more we'll be gifted with creative solutions from transcendent levels of reality. This New Moon reminds us that we're never alone; there's always help and support whenever we need it. Trust that you'll find it--put it out there and see what shows up. Sabian Symbol: The germ grows into knowledge and life. This symbol points to an unfolding process of development. Moving from potential to actualization; from something seemingly inert, to a thriving living organism.